Elaheh Soroushnia- 8 Million Tuman fine . Roozbeh Gillian is a writer and a researcher and his wife Elaheh Soroushnia is an artist and a leftist writer and human rights advocate. Reza Shahabi is an Iranian transit worker and is currently in prison and on hunger strike against the judiciary injustices for keeping him in jail while his prison term based on sentencing is finished , because of this injustices by the regime judiciary he is on dry hunger strike . 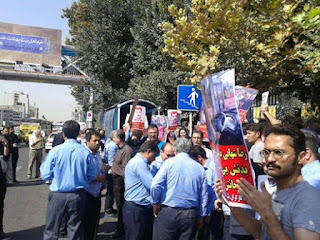 In support of him the Iranian bus drivers , workers , teachers , students , human rights activists and .....staged a protest today in front of the judiciary power in support of this union worker . More than 2000 days in prison just for defending human rights . So much violation of human rights made this unfortunately normal for many million people around the world , but this isn't normal and we have to stand and fight back against those regime that violates the human rights and support the human rights defenders including Doctor Abdolfatah Soltani who's health is deteriorating for a long imprisonment. 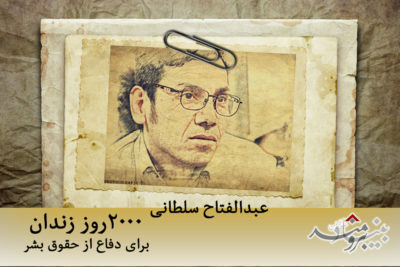 The place of Mr. Soltani is not in prison but in universities to teach students about their rights . According to news , with a call by Transit Workers Union in solidarity with Reza Shahabi and other political prisoners in Gohardasht prison who continue their hunger strike, the buses in Tehran left their lights on and lowered the speed of the buses . 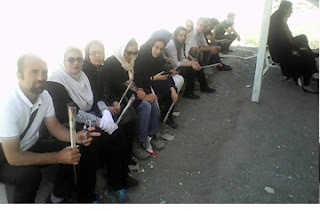 And also the members of the campaign in dense of political prisoners and several social and human rights activists gathered in front of Rejaei Shahr ( Gohardasht ) prison and chanted their solidarity with the prisoners. Based on news , Four people from this gathering have been arrested. Mr. Naser Atabati the public prosecutor of the city of Ardebil announced that, They have arrested six admin of the Telegram group . 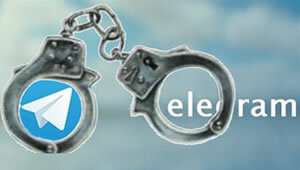 He added ; in the last week , with the help of FATA police forces and the Unit for cyber crimes in the Ardebil province , have arrested six group Telegram admin who had activities on immoral issues and were propagating for the membership of homosexualities . This judiciary official said, at present this six individuals are in custody and their equipments were seized . (Beirut, September 12, 2017) – Two Iranian journalists arrested in Tehran in August 2017 remain detained without formal charges, Human Rights Watch said today. The authorities should immediately release them or charge them with recognizable criminal offenses and ensure them fair trials. Authorities from the Judiciary Intelligence Agency arrested Sasan Aghaei, 34, deputy editor of the reformist daily Etemad, at his office in Tehran on August 13. 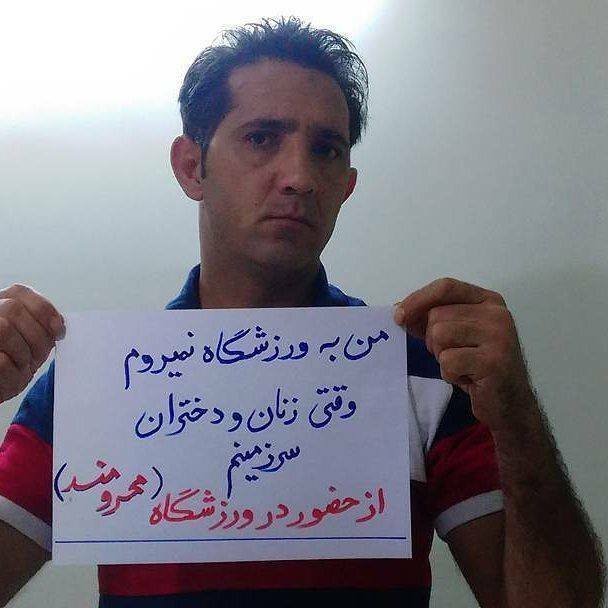 On August 22, authorities also arrested Yaghma Fashkhami, a journalist for the Didban Iran website, at his office in Tehran. Both had been arbitrarily detained previously, in violation of their rights to freedom of speech. 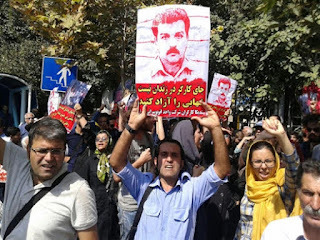 Since his arrest – the fourth time since 2009 – Aghaei has been held in solitary confinement in ward 241 of Evin prison in Tehran, which is under the supervision of the Judiciary Intelligence Agency. A source close to the Aghaei family, who wished to remain anonymous, told Human Rights Watch that “authorities are pressuring Aghaei to confess to having ties with the Amad News website,” which Iranian authorities consider an opposition outlet. “They could have simply summoned him instead of showing up to arrest him as a criminal,” the source said. Indefinite solitary confinement is cruel and inhuman treatment and can amount to torture, Human Rights Watch said. On September 11, a source close to the Fashkhami family told Human Rights Watch that the authorities who first detained Fashkhami for five days later extended the detention to one month. “The family has been going to the court every day, but still do not know what charges he is facing,” the source said. 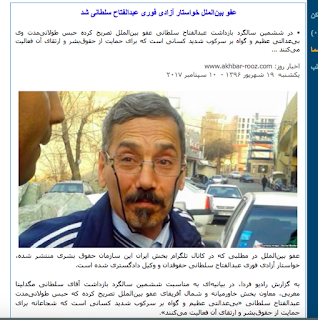 Amnesty International in a statement to the regime officials , demanded Abdolfatah Soltani the Iranian lawyer and human rights advocate immediately be released from prison . Doctor Abdolfatah Soltani have been in prison for more than six years now . Recently Mehdi Taj the president of Iran sport federation was asked about the presence of women in the stadiums . He replied: The physical and structural readiness for the presence of the women is not available yet. 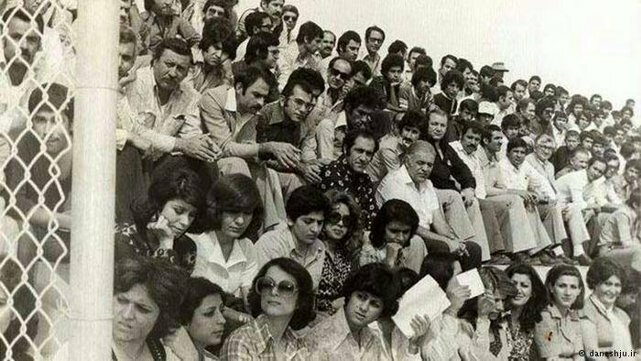 The picture below shows that Iranian women were enjoying watching the games in the stadiums more than 40 years ago. I won't attend the stadium when the women and girls of my country are deprived from entering into the stadiums.